Phil Brown, an assistant professor in the School of Materials Science and Engineering at Clemson University, joined the faculty in January 2002. He earned a BSc in 1987 and received a Ph.D. from The School of Textile Industries in Leeds in 1991. After a few years of research work, including 1.5 years at Herriot Watt University as a teaching/research fellow, he went back to Leeds as a lecturer in the School of Textile Industries at Leeds University. 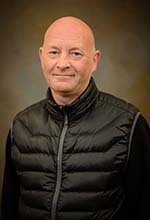 Phil’s current research interests include, but are not limited to, fiber spinning and the production of deep groove capillary surface channeled fibers, fabrication of polymeric photonic crystal fibers, the production and properties of hollow fiber membranes including examination of phase inversion conditions, the dry jet wet and wet spinning of fibers, electrospinning of fibers and nanofibers. Additional interests are in the broader areas of dyeing and finishing, including self cleaning fabrics and fibers, the crosslinking of synthetic fibers and the application of UV laser radiation to textile substrates. Brown, P. J., Nobbs, J., & Sultan, M. (2002). In-line monitoring of transparent liquids using a colour cell. Surface Coatings International Part B, 85, 49-54. Brown, P. J., Nobbs, J., & Sultan, M. (2002). Crosslinking of acrylic fibers with hexandiol and pentaerythritol, AATCC Review, 2, 46-50. Brown, P. J., Ying, S., & Yang, J. (2002). Morphological structure of polyetherketone membranes for gas separation prepared by phase inversion. AUTEX Research Journal, 2.